01. 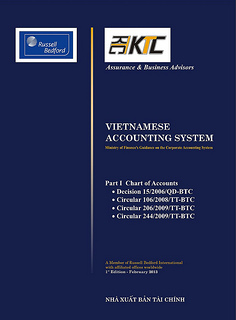 This standard aims to prescribe and guide the principles and methods of accounting turnover and other incomes, including turnover of different kinds, time of recognition of turnover, methods of accounting turnover and other incomes as basis for recording accounting books and making financial statements. c/ Interests, royalties, distributed dividends and profits. Distributed dividends and profits mean profits distributed from the stock holding or capital contribution. d/ Other incomes not arising from the above turnover-generating transactions and operations (the contents of other incomes are stipulated in paragraph 30). This standard does not apply to accounting other turnover and incomes prescribed in other accounting standards. Turnover means the total value of economic benefits gained by an enterprise in an accounting period, which arise from the enterprise's normal production and business operations, contributing to increasing the owner's capital. Trade discount means a reduction of the listed price granted by the selling enterprises to the buyers of large volumes of goods. Reduction of the price of goods sold means a price reduction granted to the buyers due to the goods' inferior quality, wrong specifications or old-fashionedness. Value of returns of goods sold means the value of the volume of goods sold already determined as consumed, but then returned by the buyers who declined making payment therefor. Payment discount means a sum of money reduced by the sellers for the buyers who make full payment for the goods before the contractual deadline. Other incomes mean revenues contributing to increasing the owner's capital, which are generated from operations other than turnover-generating operations. Reasonable value means the value of an asset exchangeable or the value of a debt voluntarily paid between the knowledgeable parties in par value exchange. 04. Turnover shall consist of only the total value of economic benefits the enterprises have gained or will gain. Amounts collected for a third party, which do not constitute a source of economic benefits nor increase the owner's capital of the enterprises, shall not be considered turnover (for example: Where an agent collects proceeds from goods sale for the goods owner, his/her turnover shall only be earned commissions). Shareholders' or owners' capital contributions which help increase owner's capital shall not be turnover. 05. Turnover is determined according to the reasonable value of received or receivable amounts. 06. Turnover arising from transactions is determined under the agreement between the enterprise and the buyer or the asset user. It is determined as the reasonable value of received or receivable amounts minus (-) trade discount, payment discount, reductions in the price of goods sold and value of returns of goods sold. 07. For cash amounts or cash equivalents not yet immediately received, turnover shall be determined by converting the nominal value of amounts receivable in future into the actual value at the time of turnover recognition at the current interest rates. The actual value at the time of turnover recognition may be smaller than the nominal value receivable in future. 08. When goods or services are exchanged for goods or services of similar nature and value, such exchange shall not be regarded as a turnover-generating transaction. When goods or services are exchanged for goods or services of dissimilar nature and value, such exchange shall be regarded as a turnover-generating transaction. In this case, turnover shall be determined as reasonable value of the received goods or services after adjusting cash amounts or cash equivalents additionally paid or received. Where it is impossible to determine the reasonable value of the received goods or services, turnover shall be determined as equal to the reasonable value of the exchanged goods or services, after adjusting cash amounts or cash equivalents additionally paid or received. 09. The transaction recognition criteria in this standard shall apply separately to each transaction. In a number of cases, the transaction recognition criteria should apply separately to each component of a single transaction in order to reflect the nature of such transaction. For example, when the selling price of a product already covers a pre-set amount for the post-sale service provision, turnover from the post-sale service provision shall be postponed until the enterprise performs such service. The transaction recognition criteria shall also apply to two or many transactions which are commercially interrelated. In this case they must be examined in an overall relationship. For example, if an enterprise sells the goods and at the same time signs another contract for re-purchase of the same goods after some time, these two contracts must be examined simultaneously and turnover therefrom shall not be recognized. e/ It is possible to determine the costs related to the goods sale transaction. 11. The enterprises must determine the time of transfer of the majority of risks and benefits associated with the right to own the goods to the buyers in each specific case. In most cases, this time shall coincide with the time of transfer of the benefits associated with the lawful ownership right or the goods-controlling right to the buyers. a/ The enterprises shall be also responsible for ensuring the normal operation of the fixed assets, which is not included in normal warranty provisions. d/ When the buyer is entitled to cancel the goods purchase for some reason already stated in the purchase and sale contract and the enterprise is not sure whether or not the goods shall be returned. 13. If the enterprises have to bear only minor risks associated with the right to own the goods, the goods sale shall be determined and turnover therefrom recognized. For example, the enterprises still hold papers pertaining to the goods ownership only to ensure receipt of full payments. 14. Sale turnover shall be recognized only when there is assurance that the enterprises will receive economic benefits from the transactions. Where the economic benefits from the goods sale transactions still depend on uncertain factors, turnover therefrom shall be recognized only after these uncertain factors have been dealt with (for example, when the enterprise is not sure whether or not the Government of the host country would permit the remittance of money earned from the goods sale therein). If turnover has been recognized in cases where money has not yet been collected, once such debt is determined irrecoverable, it must be accounted into the production and business expense in the period but not recorded as a decrease in turnover. When a receivable amount is determined unlikely to be received (bad debts) it must not be recorded as a decrease in turnover, and a bad debt reserve must be set up. Bad debts, once actually determined as irrecoverable, shall be offset with the bad debt reserve. 15. Turnover and cost related to the same transaction must be simultaneously recognized according to the matching principle. The costs, including those incurred after the goods delivery date (such as warranty and other costs), are often determined with certainty when the turnover recognition conditions are met. Those sums of money prepaid by the customers shall not be recognized as turnover but as a payable debt at the time of receipt thereof from the customers. The payable debts for the sums of money prepaid by the customers shall be recognized as turnover if they simultaneously satisfy all the five conditions specific in paragraph 10.
d/ The costs incurred from the service provision transaction and the costs of its completion can be determined. 17. Where the service provision transaction is carried out over many accounting periods, the determination of service turnover in each period shall be made by the percentage-of-completion method. By this method, turnover recognized in the accounting period shall be determined as a percentage of the completed work portion. 18. Turnover from the provision of services shall be recognized only when there is assurance that enterprises shall receive economic benefits from the transactions. If a recognized turnover cannot be recovered, it must be accounted as expense but not recorded as decrease in turnover. When it is uncertain to recover an amount which was already recorded into turnover (bad debts), such amount must not be recorded as decrease in turnover and a bad debt reserve must be set up therefor. When a bad debt is actually determined as irrecoverable, it shall be offset with the bad debt reserve source. In order to estimate turnover from the service provision, the enterprises must keep an appropriate financial planning and accounting system. When necessary, they may consider and modify the way of estimating turnover in the service-providing process. c/ The percentage (%) of the incurred costs against the estimated total cost needed for completion of the whole service-providing transaction. The completed work portion does not depend on the periodic payments or advances of the customers. 21. Where services are provided through different but indivisible activities and over many certain accounting periods, the turnover in each period shall be recognized according to the average method. When there is a basic activity compared with other activities, the turnover recognition shall be effected according to such basic activity. 22. When the result of a service-providing transaction cannot be determined with certainty, turnover therefrom shall be recognized corresponding to the recognized and recoverable costs. 23. In the initial phase of a service-providing transaction, when its result cannot be determined with certainty, the turnover therefrom shall be recognized as equal to the recognized and recoverable costs. If costs related to such service are surely irrecoverable, the turnover therefrom shall not be recognized, and the costs already incurred shall be accounted as expense so as to determine the business results in the period. Where there are reliable evidences that the incurred costs are recoverable, the turnover therefrom shall be recognized according to the provisions in paragraph 16.
b/ Turnover is determined with relative certainty. b/ Royalties recognized on the basis of accruement in compliance with the contracts. c/ Distributed dividends and profits shall be recognized when shareholders are entitled to receive dividends or the capital-contributing parties are entitled to receive profits from the capital contribution. 26. Actual interest rates are interest rates used in the conversion of sums of money receivable in future throughout the duration in which fixed assets are used by other parties into the initially-recognized value at the time the fixed assets are handed over to the users. Interest turnover consists of the allocated amounts of assorted discounts, additional amounts, pre-paid interests or differences between the initial book value of debt tools and their value upon maturity. 27. Where uncollected interests on an investment have been accrued before the enterprise purchases such investment, if the enterprise manages to collect interests on the investment, it must allocate such interests to the periods prior to the investment purchase. Only the interest portion of the periods after the purchase of the investment shall be recognized as the enterprise's turnover. The interest portion in the periods prior to the purchase of the investment shall be accounted as decrease in the value of such investment. 28. Royalties may be accrued under the provisions of the contracts (for example, the royalty of a book is accrued on the basis of the quantity of copies per publication and on the publication times) or calculated on the basis of each contract. 29. Turnover shall be recognized when there is assurance that the enterprises shall receive economic benefits from the transactions. When an amount which has been recorded as turnover becomes irrecoverable, such irrecoverable or uncertainly recoverable amount must be accounted as expense incurred in the period, but not recorded as turnover decrease. 31. Revenue from the asset liquidation and sale is the total amount received and receivable from the buyers through asset liquidation and sale. The asset liquidation and sale costs shall be recognized as expenses so as to determine the business results in the period. 32. Collected debts which had been written off and included in the preceding period's expenses are bad debts which had been determined as irrecoverable, written-off and included in the expenses so as to determine the business results in the preceding periods, but now recovered. 33. Payable debts whose owners no longer exist are payable debts whose owners are unidentifiable or no longer exist. Interests, royalties, distributed dividends and profits. c/ Turnover from the exchange of goods or services according to each type of activity mentioned above. d/ Other incomes, irregular incomes presented in detail.